Intel IXP425 was a network processor, I'm using Avila Gateworks GW2348-4 at my company during the development of first version of wimax project at the year of 2006. 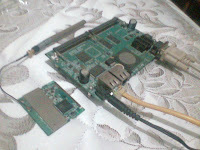 This is my first project using embedded linux. Main tools used were buildroot with kernel 2.4 patched by timesys along with its toolchain. It's not a free ones so not many explanation available at that time. These day I had success recreated a free source code using kernel 2.6 with some modifitacation that i took from avila BSP and I manage to add atheros wifi device driver support for the kernel and madwifi application at the buildroot. Main advantages in creating embedded linux for this board were the network driver and encryption support that currently not supported by linux kernel due to license problem. You need to download the network source code from intel site and patched it to kernel source code. I've been download it and try it over and over again but always ended in version conflict with other source code. Here i'm succesfully injecting Ixp4xx npe driver version 2.4 from intel site itself and arranged it for easy compilation for you with step by step compilation. Some script are taken from gateworks bsp site, and also from its structure that I studied, then I managed to arrange these. This also a documentation for me and helping you who had the same problem as me try-in to make this board useable with free source code. For the host linux i'm using opensuse 11, with kernel development option checked during installation. You will need the texinfo downgrade using yast from installed one (ver 4.11) to texinfo version 4.5. Mine using fedora texinfo 4.5 rpm and it work well. For other host environment you should check the texinfo version. Besides those files, you still need internet connection to download the rest of the needed files. Buildroot will create the image of root files system and the toolchain produced will be used to compile the kernel. You may download all files that I upload it on mediafire on the Gateworks GW4328-4 projects. Extract both files using command line as shown below, note that you must run as non root user during all compilation process to avoid system damage. Or you may download the original buildroot-2009.02 and linux-2.6.21.5, download files madwifilinux2621, it consist two folders, one is buildroot folder, second is linux-2.6.21.x folder. Copy all files on the directory of extracted buildroot and linux kernel, replace original ones. If you not planing not to add madwifi linux just download this files ixp400lib24linux2621x, extract it then copy recrusively all files to original linux kernel source, overwrite the old ones. For the buildroot you may keep using the original one. #> cp -vrf ixp400lib24linux2621x/* linux-2.6.21.5/. Now we had all files needed. We can start building linux for the board now. Edit target/generic/target_skeleton/inittab adding quote at tty1 and tty2 respawn, preventing for keep calling it, and open quote at ttyS0 to enable serial console. Adding files at target/generic/target_skeleton/init.d/S10loadixp400 to load ixp npe module. Manually we need to use command line below to activate the ehernet device. You may open those changes I've mad to evaluate them and changes if as you need. Go to buildroot directory, on my patched version you can find broot.config and busybox.config, they were backup configuration files for Intel IXP425. The configuration that I'm use were backuped at the broot.config files. You may load it from buildroot menu config or simply copy broot.config to .config, then run make menuconfig. Check wheteher the target were arm and processor were xscale. Exit and save then start building buildroot by typing "make". After a little while, buildroot will finish compiling. The binary image will be palced below binary/uclibc/.. directory, toolchain will be palced below staging_dir/usr/bin/.. directory. This toolchain will be used to compile the linux kernel image. The root file system produced are not ready to deploy, we still need to inject the kernel modules to /lib/modules directory at the produced file system. Extract the modified linux kernel, inside folder some modification had been made and tools needed were are ready provided. You can find ComArmMake & InstallModules script for fast process. The Path to the toolchain exported to linux path environment, it will enable the kernel script to get the toolchain with the prefix armeb-linux- as the cross compiler for the target. Change to be made if you place the buildroot folder and linux folder not in the same directory, adjust it to yours. Same as the above about the path of the toolchain (gcc) along with make modules_install command pointed to the target skeleton and project files system. This script will install the modules needed by kernel to the source of file system. Changes to your directory if kernel and buildroot not in the same directory. Changes I've made in kernel source were at drivers/ directory. They are modified Makefile to include ixp400 ethernet driver and net/wireless/madwifi driver for atheros wifi card. The other changes are at the files include/asm-arm/mach-types.h, I change the type of Avila Machines Value to 0xF5, its number that read by the kernel during boot time at the avila board. You may evaluate all changes by compared to the original ones. Best you download my linux kernel source version, hope it will work well and easy to compile, because I had bad experience more than one time failed to compile and deploy the kernel image to the avila board. The kernel configuration files were backuped to the kernel.config files. Copy it to .config then type in ./ComArmMake menuconfig. Below some captured image of kernel setting. The kernel script will start compiling, and will resulting modules in driver directory, and kernel image at arch/arm/boot/zImage. This kernel image are now ready to deploy to the board, but the file system need to change in order to install needed modules by kernel. Type in my script to install modules. Check at the buildroot-2009.02/target/generic/target_skeleton/lib folders, check whether the modules/ directory were exist, this show that the modules succesfuly installed on the source filesystem. Then you need to recompile the buildroot to make new file system. For sure, we need to remove old image at the binary/ directory, then start building it again. Now we had two files, first one is buildroot-2009.02/binary/uclibc/rfs.armeb.jffs2 and linux-2.6.21.5/arch/arm/boot/zImage. Both need to be deployed to the board via a TFTP server that the redboot on the board can get it via ethernet cable. Assume that our board already had redboot installed, if not, you will need to get a jtag downloader and redboot image from avila and flash it to the board with a working version of redboot. The TFTP server at opensuse 11.0 were configured via YAST, for other host you had to read it's own manual on how to activating the TFTP server. it will create /tftpboot directory if not exist. Both files are now placed in tftpboot directory with tftp server running. Now we can get those files from gateworks board via ethernet using tftp protocol. Prepare the board firmly, connect to power supply, plug ethernet cross cable if you connect the ehernet directly to computer or a normal ehernet cable via an ethernet hub/switch running host linux, also plug the serial cable to other computer running hyperterminal. You may use the linux host to run minicom as serial terminal. But here I need to capture the process for you so I run everything remotely using a laptop running windows with a linux host computer running remotely via putty using ssh terminal. Set the serial configuration at hyperterminal to baudrate 115200, 8 data bit, no parity and 1 stop bit. Power the board, then press ctrl+c to enter redboot menu. We create image name zImage to hold the kernel and rootfs to hold the file system. You may change the size of each as you need, please learn the redboot command and flash allocation before you change it. Starting base address of allocation flash address must be set after the redboot area and before the redboot configuration. The space length of image must fit the image itself. Set the ip address which the gateworks board and the host linux pc are in the same subnet. Mine setting are PC are 192.168.0.20 for my host, and my board set to 192.168.0.23. You must change them to fit yours setting. To test the connection, you can ping the board from linux host pc. Load the image via tftp server, count the image size then write it to the flash. To write it ti flash space that we had prepared at the fis create we must calculate the loaded zImage size, from the loading process we got the zImage size by subtracting length of loaded files to its base address location, they were: 0x23ffff - 0x80000 = 0x1cf8d7. Now we need to configure redboot script to load the linux kernel and seting up parameter needed by system. ... Unlock from 0x50fe0000-0x51000000: . ... Erase from 0x50fe0000-0x51000000: . ... Program from 0x03fe0000-0x04000000 at 0x50fe0000: . ... Lock from 0x50fe0000-0x51000000: . Now reset the board by typin reset command or push the reset button or plug/unplug the power cord. Trying NPE-B...success. Using NPE-B with PHY 0. Copyright (C) 2000, 2001, 2002, 2003, 2004 Red Hat, Inc. FLASH: 0x50000000 - 0x51000000, 128 blocks of 0x00020000 bytes each. RedBoot> exec -c "console=ttyS0,115200 root=/dev/mtdblock2 rootfstype=jffs2 rw mem=64M @0x00000000"
Uncompressing Linux..................................................................................................................................... done, booting the kernel. Time: OSTS clocksource has been installed. JFFS2 version 2.2. (NAND) (C) 2001-2006 Red Hat, Inc.
Minstrel automatic rate control algorithm. Default login are "root" with no password. Congratulation, you have run your linux on Gateworks board succesfully. The source I modified were far from perfect, you still develop your own modification to fit your need. I hope this can help you on your project using this board. Feel free to ask and please leave a comment below. Huntuzcool Blog. Picture Window theme. Powered by Blogger.